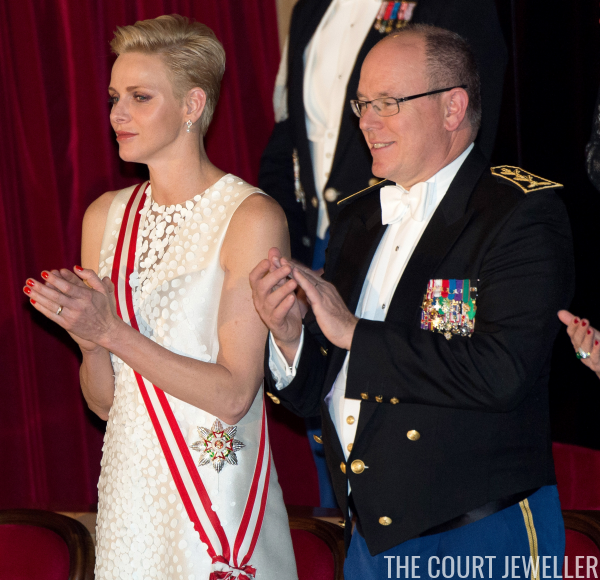 Time for a look at the evening glitter at the National Day Gala tonight in Monaco! We had three Grimaldi ladies in attendance, and each wore a bit of sparkle. 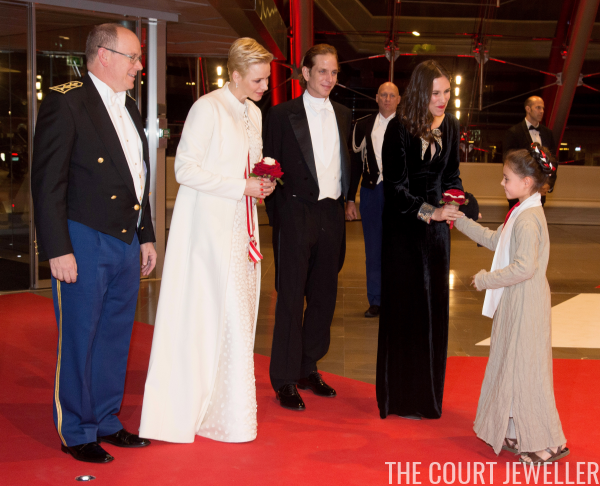 Princess Charlene arrived at the gala wearing a dramatic white coat over her evening gown. She accessorized with a pair of diamond and pearl earrings. Inside the gala, we got a look at the dress underneath the coat, plus the sash and star of the Order of Saint-Charles. (I think an additional brooch, placed at the shoulder, would help to secure the sash more effectively.) For the gala, Charlene set aside her massive engagement ring in favor of her simpler wedding band. 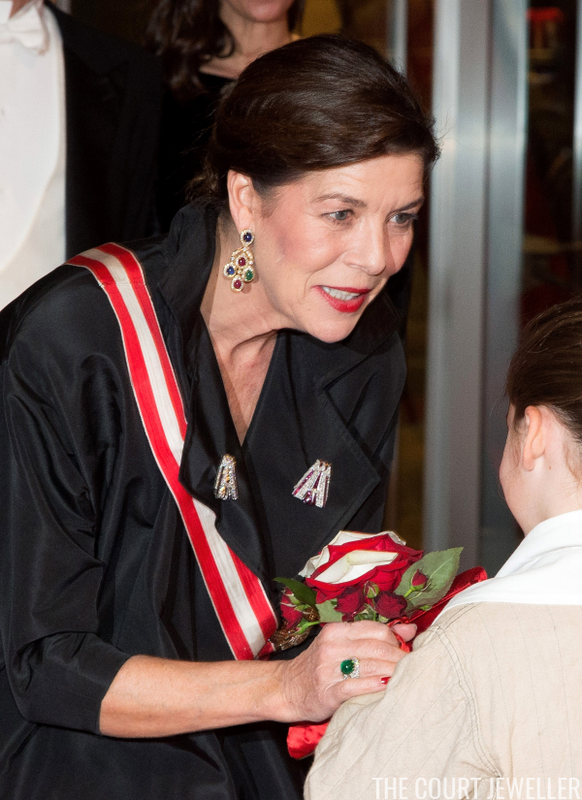 Just as she was this morning, Princess Caroline was the star of the jewelry show. She wore a pair of girandole earrings set with diamonds, sapphires, rubies, and emeralds; these have been in her collection for years. She also wore an emerald and diamond ring, plus a very intriguing pair of diamond and ruby clips. I feel like these brooches have a longer Grimaldi history, but I'm having trouble placing them. Perhaps their "A" shape suggests a legacy from the late Princess Antoinette? 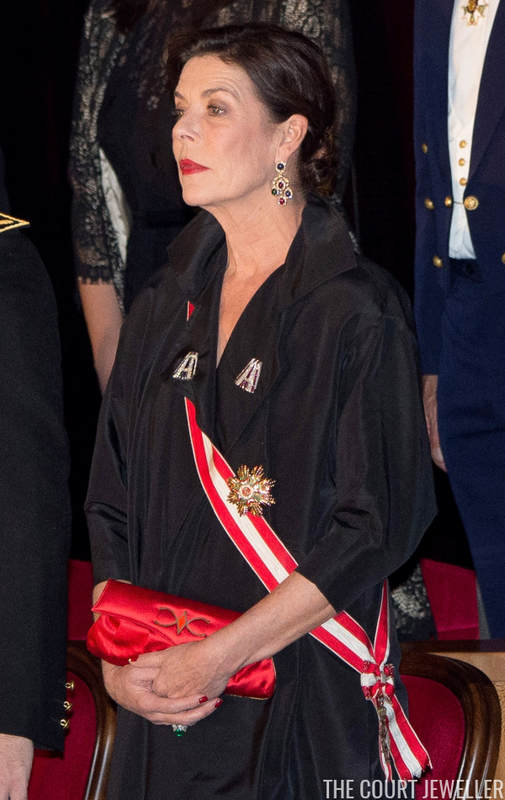 The clips coordinate nicely with the sash and star of the Order of Saint-Charles. 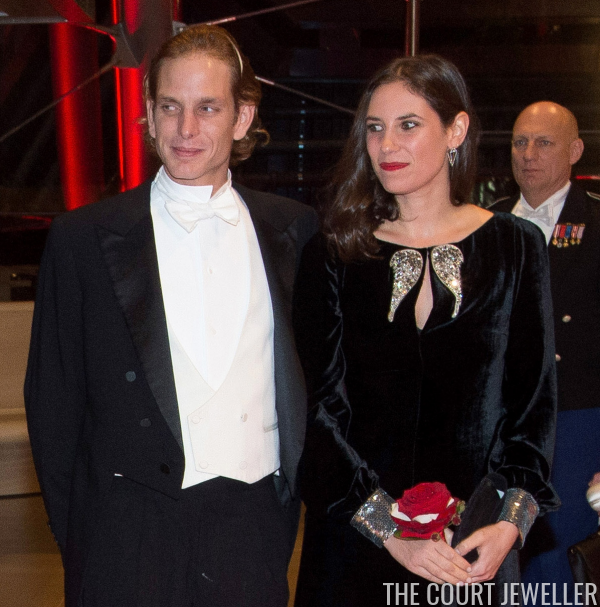 Tatiana Santo Domingo, wife of Andrea Casiraghi, wore a pair of ultra-modern diamond earrings with her velvet evening gown. The gown had embellishments of its own: a pair of glittering wings stitched at the neckline, plus sparkling cuffs.